Alongside the 2010 SPSS Mare and Stallion Gradings at Heart of England Equestrian Centre (by kind permission of the Ballantyne family, on the 16th October 2010, an In-Hand Premium Show was held for the fifth time. There were classes for foals, youngstock and broodmares (all to mature no larger than 158cm), with Premium Certificates being awarded depending on the mark achieved against the scoring criteria. The Supreme Champion was the yearling colt, Bathleyhills Monet who was bred by his owner Penny Walster of Bathleyhills Stud in conjunction with Sabine Meiners of Hilkens Stud, Germany. Monet is by the German Sire Casino Royale K out of Mona (by Matcho). Reserve Champion was another yearling, the filly, Antsar Little Gem. "Gemma" was bred by her owner, Hazel Cornes and is registered as a Welsh Part-Bred being by Greenbarrow Mr Smee (WPCS PB) out of WPCS Sec B, Brookwater Private Dancer by Cwrtycadno Llewellyn. Gemma is also registered with the SPSS. Full results are given below. A 1st Premium is awarded for an average score of 8 or higher, a 2nd Premium for an average score from 7.5 to 7.99 and a 3rd Premium for an average score of between 7 and 7.49. The Judges for the 2010 In-Hand Show were Herr Hans-Heinrich Bruening and Mrs Lynne Crowden. Using a German judge for the first time for the In-Hand Show was popular with those putting ponies forward - although Penny Walster of Bathleyhills Stud, owner/breeder of the Overall Champion as well as of the foal class winner, commented afterwards that it was listening to the previous years (English) SPSS show and grading judges and acting on their comments that has resulted in her having such a successful show this year. Julia Shearwood (www.equestrianphotography.co.uk) was the professional photographer present at both the Mare Grading and In-Hand Show. Pictures of all the participants are available on her website for people to view and buy. 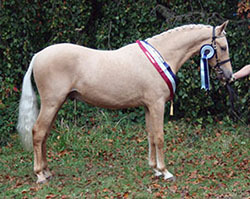 Class 2: Mares likely to breed a Sports Pony (Born in 2006 or before).